These first few blogs are, I believe, important, and from the response to my last blog about limiting ourselves to one kind of painting – so do you. It would have been easy to launch straight into the mode: ‘This is my painting of XYZ’ ‘These are the Work in Progress shots etc’. Oh yes I have those blogs lined up, and we will get to them soon enough, but these few ‘Introduction’ blogs are about subjects which are relevant to us all, no matter what your favourite subject is. What made you become an artist? Lets face it – it ain’t easy. Right? Heather – when did you realise you were an artist? Were there artists in your family? You know the funny thing about writing a blog is that the process makes me realise stuff that I hadn’t thought to much about for a long time. I am finding it hard in some ways and almost therapeutic on the other. We all have stuff in our lives that bring about different feelings. Artists need to relate. They need to understand other artists so as to understand themselves more. Why? Because more often than not they feel isolated and in some way ‘separate’ from friends and family. Some are actually isolated physically – eg live alone, single parents, limited income etc. Because artists who have a clear understanding of WHY they produce art -make more progress in accomplishing a standard of work they desire and – in my experience they build better careers for themselves. So yes I had a bit of an unusual start as an artist (some of you have ploughed through my BIO – you get a medal for that lol! ), but I bet some of what I am about to say resonates with you. Here is the deal – I tell and then you tell – use the comments box beneath to leave your thoughts and responses to the above question. Question One: Heather -When did you realise you were an artist? Answer: When someone told me! I was a child – maybe 6 or 7 years old and I though all kids were like me – always with pencils and crayons in my hand. I also knew other kids were not like me in that I was constantly ill for most of my childhood – had every illness going and I could not read or write properly until I was 9 years old and managed to put a full term in at school for the first time. Drawing – colouring books and music were my life – not playing outside with the other kids. I was OK with that I remember. So – I was overweight – (no exercise) and used to living in my own world. No brothers or sisters. Mum and Dad worked – Gran looked after me and taught me to knit, crochet, cook design knitting patterns from the age of 5/6 yrs old. I finally got a bad dose of Glandular Fever aged 13. Whilst recuperating from hospital I saw a face on TV – a face so beautiful I rushed to get what was to become my first portrait done before the song this guy was singing finished. This was in the days before video. ( This is a pretty long and fascinating story – and will be expanded on later for a group of people who follow this man and his amazing talent to this day ). Yes that is me aged 13. Photo taken in the Town Hall at Rugby, by the Daily Mirror. It was printed on page three – before page three girls existed! 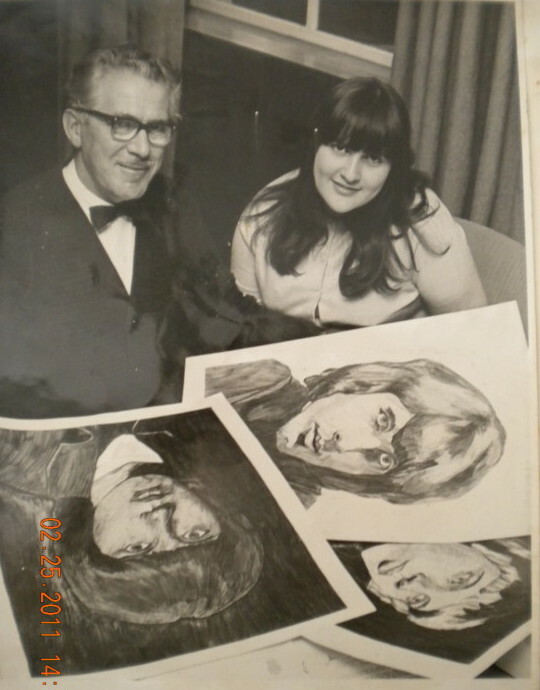 Those large pencil portraits are of the group The Walker Brothers, they got very famous and I ended up with a BBC contract as a teenage artist aged 14 yrs old. For the next 4/5 years I was the ‘portrait darling’ of the press and TV. Now under those circumstances – you are called an artist from day one. The upside – I got to meet anyone just by doing their portraits. Boy that was fun – i the middle of the swinging 60’s! The downside: my school worked out that every time I was off school ill (that lasted until I was around 15) – there would be something in the papers! The bigger downside: Everything I did as a teenage artist was in the press and that affected my life on many levels. The Strangest Downside of all: I knew I was an artist – but then I felt no different than I did before all the press attention – but now I produced portraits. People said I was an artist because that is what artists did – produced ‘art’. I learned to smile and say thank you. A good Upside: But the only time I felt like an artist was when I was alone with my work in progress – knowing I was improving all the time and loving it. 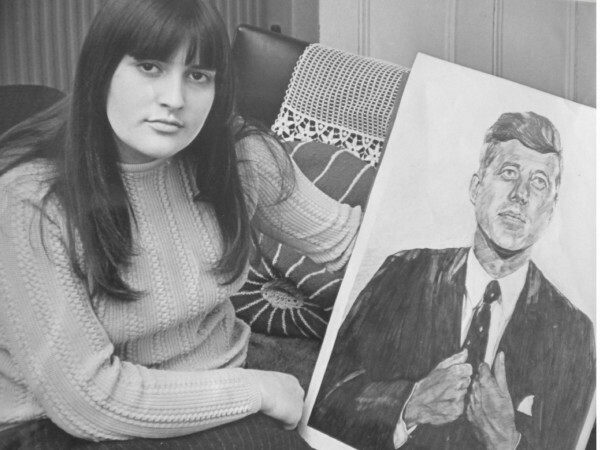 As soon as I finished one portrait – I was keen to get on with another one – and not for the press attention. But because I felt I was learning something. I was developing a pride in my work. That is when I knew what it was to be an artist for the first time. 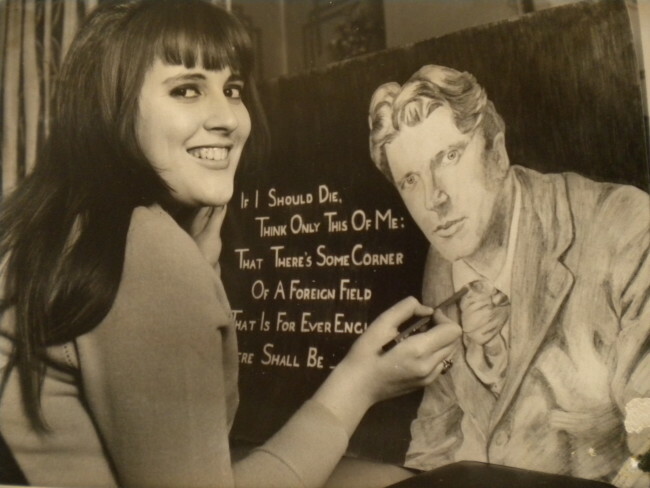 The real bummer: I was in the middle of all the press interest and the person who was such a magnificent ‘manager’ of his artistic child – my father. Between the two I found I lost my personal identity as an artist. I turned away from it all, got a boyfreind, got married, became a Mum, and knew all along how disappointed my father was in me. He strongly believed in the power of publicity – I didn’t. I had lived it for 5 years and knew better. I makes you famous – it doen’t make you an artist. When a daughter becomes a mother, there is a slight shift in the relationship with her own father – I was not a child anymore – but a mother in charge of her own child. I commanded that respect. That is when I became an artist. 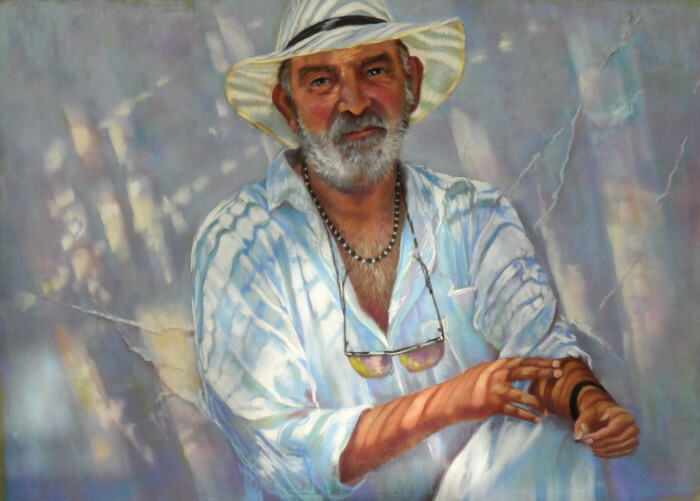 My daughter was less than one year old – and I began studying and learning, not just about portraiture – but all subjects,including the History of Art at a local college for an O level exam. For a long time I hid all of this studying from my father. By the time my daughter was three I had organised and produced my own first exhibition at the Preston Guildhall – where it was a permanent fixture for five years, and comprised 36 portraits of musicians and songwriters. That is when I new for certain what it meant to become an artist – and yes I could ring up the daily papers whenever I wanted to – I had learned a lot as a teenager. Question: Were there other artists in my family? Answer: My Gran was a artist/ craftswoman of enormous talent – a trained pianist who was forced to give up her passion to earn a wage before the war and help look after her family. And my father – was always known as a poet and wordsmith from the age of 16 years old, and a great creative mind. For a while he lost his creative way which is why I became the focus. With my encouragement he found his own creative path once again. So are there any conclusions to be made about my story? Was my colourful and exciting teenage career of use to me as artist? Only as far as my ability to deal with the press and understand their agenda. As for my being an artist – no it didn’t help. It fact it got in the way of me going to study art at college or university. Did I learn anything about myself as an artist during this time? Yes – that what matters is you and your relationship with your work and your love of doing it. Everything else is a diversion. Was any of it of use to my career as an artist? Only in as much as I have some impressive stuff to quote, and some interesting tales to tell. Also in that it gave me a real insight into public relations, publicity management and press, TV etc. But that has limited uses. It did give me confidence beyond my years. That is of enormous value to any woman in particular, developing a business side to their art. SO there it is – Both a Happy and a Sad tale. In some ways it is a wonder I ever made it with my need to create intact. Do You Define Yourself Or Limit Yourself as an Artist? The question is – What do you call yourself – as an artist? I had a couple of paintings accepted for the Spanish Pastel Society (ASPAS) International Biennial in Oviedo next February. It is a great show – I have attended the last two and I’m there proud to represent the UK. There are usually in excess of eighteen countries represented – mainly from Europe, Russian China, the USA, Canada – real big event. If you are in Spain – and a pastelist – you should be there. So back to my two paintings. One of my old favourite painting venues back in the UK – Capsethorne Hall is a bit of a Downton Abbey – with a great pond and lake which make great painting. I love painting landscapes and I know that many of you do too. Landscapes are personal and yet universal. They are evocative, and diverse. Amazing how many people in Spain love my work of the English landscape. Although many of my British clients like to by mediterranean scenes! I have drawn or painted portraits all of my life – well at least since having ditched the colouring books that occupied my childhood. ‘Get away with what?’ I asked. ‘Getting two pieces of work into an International show – in two different genres?’ In other words – one a landscape and one a portrait? Truly it hadn’t occurred to me – but it should have done. For me it was an old monster that had reared its ugly head – from my past. The monster of ‘putting artists into convenient boxes’. Catagorizing and labelling you and saying – ‘She is a landscape artist’, and ‘He is a portrait artist’. In fact – it is quite rare to find artists exhibiting in the big International Exhibitions – showing more than one side of their work. Of course many artists don’t develop more than one side of their work – and that’s fine. When you are learning you might well jump from drawing an elephant to drawing a landscape, or painting a flower. then you might try your first portrait. 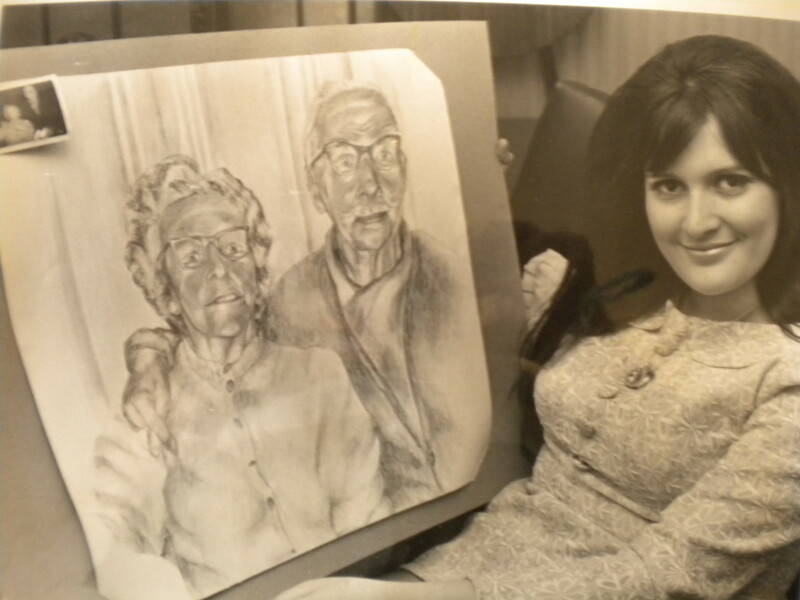 You might – like I did – find a passion for portraiture at an early age (13) and pursue it wholeheartedly. But somewhere along the line my artistic = curious nature – led me to landscape, skies, water scenes townscapes – still life………. I can’t think of many of my favourite artists throughout the ages – who haven’t painted in more than one genre. It is true that part of this problem of labelling artists stems in part from the gallery system. If you take your work to a gallery – (that is if you can find one in the internet age) in the hope that they will help you up the career ladder, it has been the case in that a gallery would assess your work on the fact that you had settled into one genre and stuck to it. 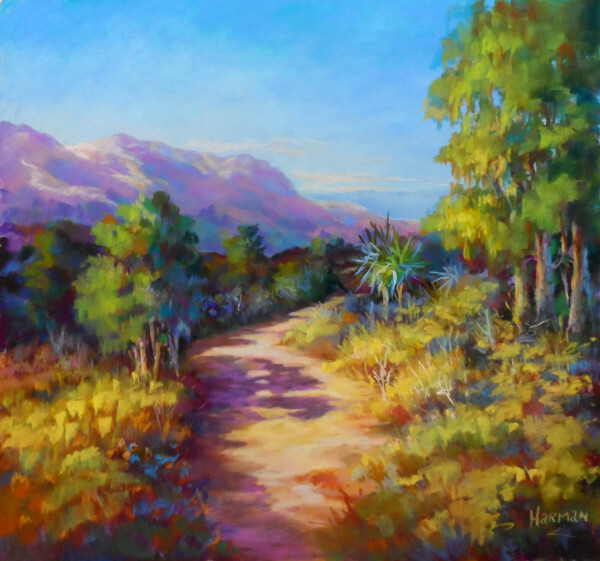 Galleries I have had involvement with didn’t want my portrait work ( because it was then up to them to get me clients – and many weren’t up to the job) but they were interested in my landscape work, because they could sell it. Farther up the gallery ladder – the big London galleries would not look at someone who had not developed their ‘specialty’. Yes galleries and curators have had a large part to play in this ‘pushing artists into a bracket’. But what I don’t like to see is artists doing it to themselves. I think on e of the greatest disservices you can do to yourself is to put yourself into a bracket. Think of it this way – would a musician do it? Or a songwriter – only write one kind of song? Can you imagine a dress designer – one of the big or smaller names – saying I only design pants. I dont do blouses and shirts. I make skirts but not tops. They would be out of business pretty quickly. Does a hairdresser only do one style? I am an artist. I use paint. 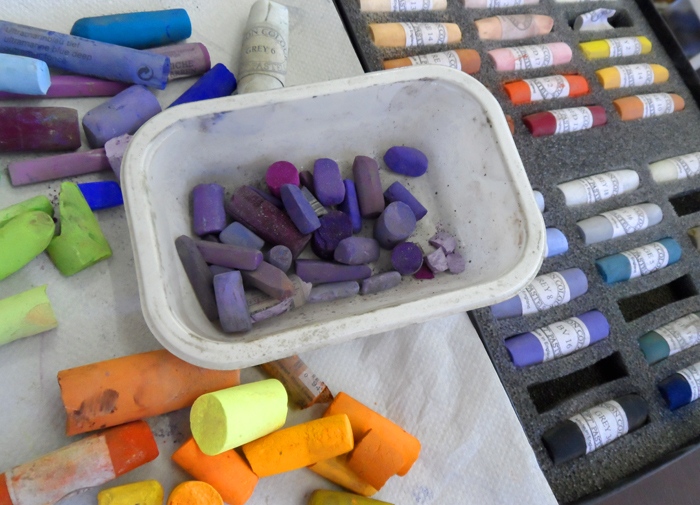 My paint of choice is pastel – but I still use oils occasionally, and watercolour. I love using nothing more than a pencil or a stick of charcoal. I wouldn’t mind betting some of you diversify in this way too. But how many of you catagorize yourself in terms of subject? I come across is all the time on Pastel Artists UK. Sometimes because the commissioned artist route is a tempting prospect and that usually means portraits of some kind. And sometimes it is because I have so many beginners and love it when I see them having a go at different things – just loving the pastel – and discovering as they go. But restricting yourself is like putting yourself into a room and shutting all doors and windows except one – and hoping that one will never shut on you. It is also giving you a form of tunnel vision. Specializing in one genre is fine – when you have sampled and learnt all you can from other genres too. Rembrandt needed to know how to paint landscape ( his landscape pen and ink called ‘The Mill’ makes me cry it is so beautiful). John Singer Sargeant the same. His watercolours are the stuff I dream of owning. But you know I am pretty proud of having two genres on show within the same exhibition. I can recommend it. Why? Because those tricks of light that everyone comments on in the portrait – I learned from landscape. And the tonal depth of the landscape – I learnt from portraiture – where tone is important. Pastel. The Easiest Medium in the World to Use. Right? 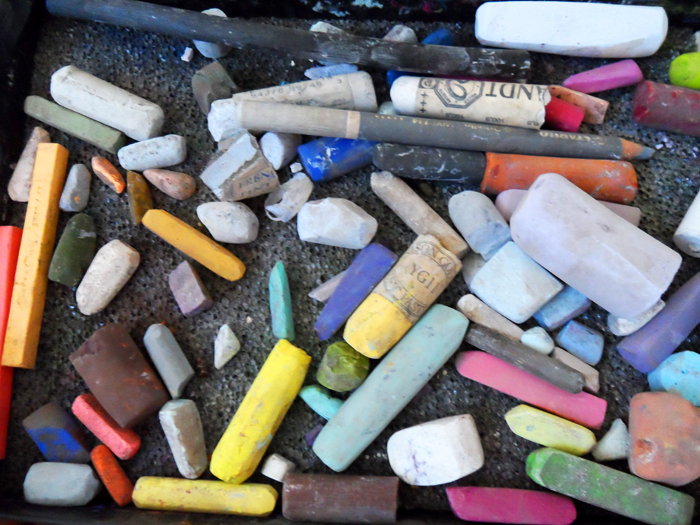 Pastel – the easiest medium in the world to use – Right? I’ve heard that a few times. Well as we know - Pastel isn’t easy. In fact it is as complicated and challenging as it is exciting to use. It is without doubt the most versatile and diverse medium I have ever used, and I also paint in oil and watercolour. All the more reason why there is a need - a demand even for tuition from pastel specialists. For all my pastel friends who have known for some time that I have been working towards a goal – well guys this is part of that goal. After much planning the Pastel Academy Blog is born and as with all new born babies it has a long way to go before we can see its full potential, but what is interesting is how it will develop and how it began. When I moved to Spain some 10 years ago, I left behind most my teaching work. I had been working for Cumbrian and Lancashire County Councils in the Adult Residential colleges Alston Hall and Higham Hall) for around 20 years, where I taught Pastel residential courses alongside portraiture; totaling around 12-14 weeks a year. 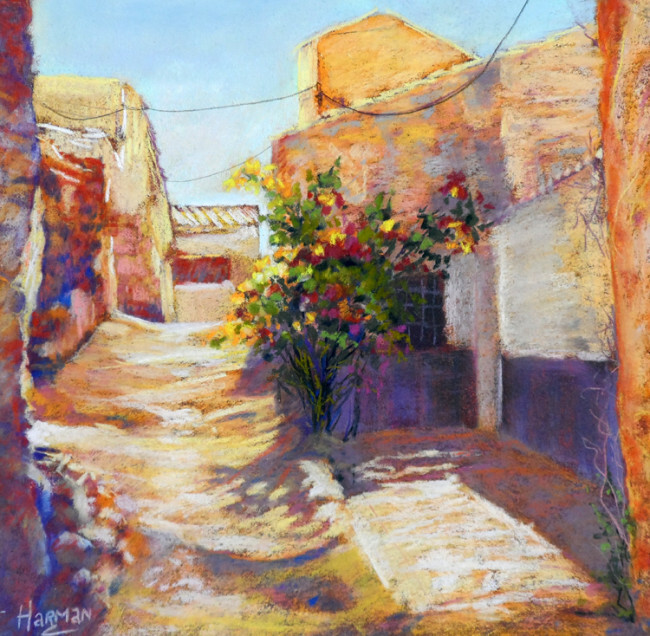 In addition, I was organising and running painting holidays in wonderful hot places, running a couple of local groups, tutoring privately, and writing articles for the British Art Press. I wasn’t the only Pastel tutor with a pretty full calendar of teaching commitments; there were a few of us nationwide. The courses sold well and I had many students from different parts of the world enrolling. Where were all the Local Authority Classes? A few years ago I began getting messages from students back in the UK that they were finding it difficult finding courses and pastel tuition generally, depending on where they lived basically. Local authority evening and day classes were closing and of course they were usually the starting point when starting to draw and paint. I took a look at the situation and found that 2 or 3 of my contemporaries had also effectively retired, and the net result was large gaps in the pastel tuition market. In the south of Spain – I run a regular local group – and within a few years having started from scratch (learning how to draw ) they held their first exhibition last December. Many of my local group could compete with many of the artists I see throughout the European societies; I know not just because I trained them, but because having been involved with the French and Spanish societies for a few years now – very few pastel artists have been ‘taught’ by a pro teacher and pastel specialists, and sometimes this shows in lack of basic painting lore and drawing skills. The Self Taught Route – I bet this resonates with some of you. I am a Self-Taught artist out of necessity; I started as a young child. There is nothing wrong with being self-taught, but having no tuition whatsoever can be an issue; it can be frustrating and lonely, and can hold an artist with ambition back. If you want a teaching career in addition to your art – time can be important; do you want to take years to learn? No, of course not. Equally so if you are picking up your pastels for the first time in retirement. For some, of course – tuition might be a luxury, and for others it might be the preferred way of learning. Being self taught does mean though, never being sure if you are ‘on the right track’, and maybe not learning trusted and tested methods and techniques. Of course not wasting money and time making costly mistakes is also a factor. 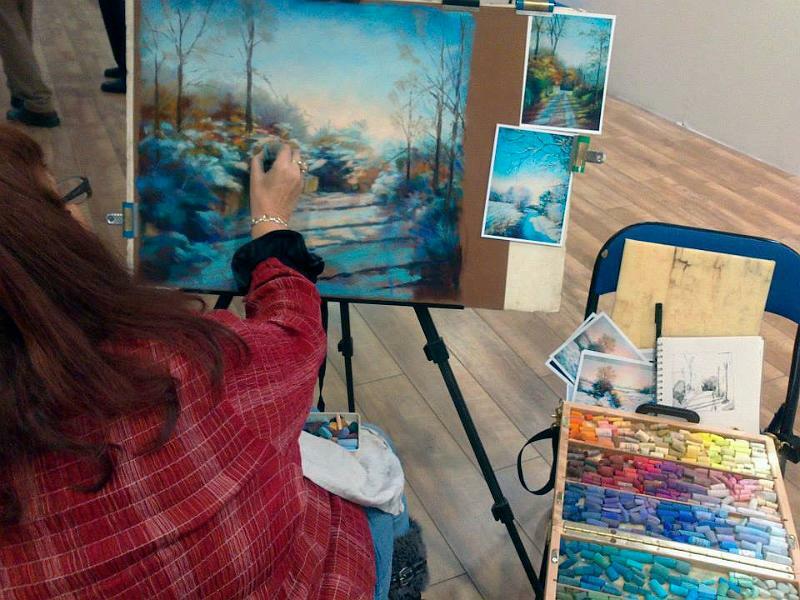 Pastel Artists UK and why I started it. 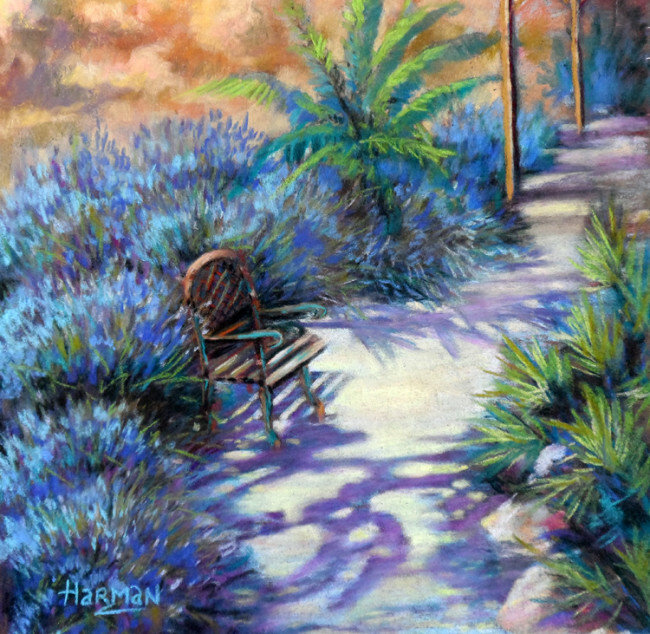 Set up in the early New Year 2014 Pastel Artists UK is now an extremely successful Facebook group and for me, it is both gratifying and frustrating. Gratifying because they are a great group. Why frustrating? Because I am a tutor and there is only so much guidance you can give on a Facebook group. The group has consolidated what I already suspected; overall pastel tuition, by a professional pastelist/tutor, is poor to non-existent, with notable exceptions obviously. Ironic that this should be the case at a time when the popularity of pastel is on the rise, with new Chinese and Japanese Societies joining the ranks of the European, American and Australasian societies. The group have been a fantastic market research resource and readily responded to my frequent questions for facts on this or that aspect of their work, and they have guided me well. Other pastel groups to which I belong have also, and their needs have proved to be similar, no matter what country they live. Provide Tuition and to that end I start filming my long planned online courses later this month – more about these in the next blog – there is a lot to talk about. Build and develop a Pastel Resource Hub – to house articles relating to pastel and related materials resources. Suppliers etc. Not just in the UK, but hopefully worldwide. Build the beating heart of ‘IT’ – the blog. I shall be blogging on a regular basis, and also inviting guest Bloggers on pastel and related subjects. ‘Related Subjects?’ The other function I want ‘IT’ to do is offer advice and guidance on the business end of being an artist; encouraging and guiding (mentoring) those who can and want to teach, advice on art marketing (I was admitted to Lancaster University in 1990 on an Arts/Marketing ticket – and although I diversified, the marketing side remains a passion.) There will be guest bloggers on that issue too. Advice for setting up artists websites. Meanwhile there is still much to do. I am still working on my website to make the right adjustments and future integrations, and other features that I will eventually get round to. ‘IT’ – finally has a name – The Pastel Academy Online. PAO for short. In the short term, my goal is to establish this blog, keep you all informed as to what is happening in my regular Update Newsletters, and film courses. No, but it will be very worthwhile, and this is the real busy stage. Other stuff as it arises will be in the Newsletters and hear of course, but at the moment I hope I have given you enough to mull over and please feel free to open up a discussion on our group, and add any comments in the section below. A few years ago I began getting messages from students back in the UK that they were finding it difficult finding courses and pastel tuition generally, depending on where they lived basically. Local authority evening and day classes were closing and of course they were usually the starting point when starting to draw and paint. I took a look at the situation and found that 2 or 3 of my contemporaries had also effectively retired, another was working increasingly in the USA and the net result was large gaps in the pastel tuition market. 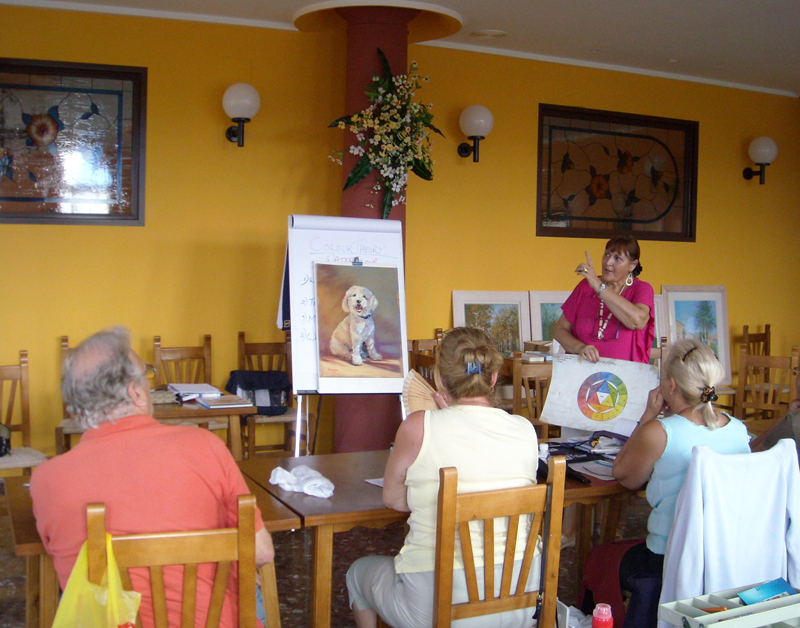 Of course in the south of Spain – I run a regular local group – and within 3/4 years having started from scratch – learning how to draw – they held their first exhibition last December. Many of my local group could compete with many of the artists I see throughout the European societies; I know not just because I trained them, but because having been involved with the French and Spanish societies for a few years now – very few pastel artists have been ‘taught’ by a pro teacher and pastel specialists, and sometimes this shows in lack of basic painting lore and drawing skills. I am a Self-Taught artist out of necessity. I was a sickly child and drawing was my diversion along with music. There is nothing wrong with being self-taught, but having no tuition whatsoever can be an issue. Having learned very early on in my life to manage without tuition, I muddled through and used whatever books were available. I imagine you have done that too when needed. But when you are of retirement age that can be difficult and frustrating. If you want a teaching career in addition to your painting work – time can be important; do you want to take years to learn? No, of course not. So yes tuition has a great deal of advantages – not least of all learning trusted and tested methods and techniques, and not wasting money and time making costly mistakes. And there is so much to be said as well for knowing that you are on the right track. 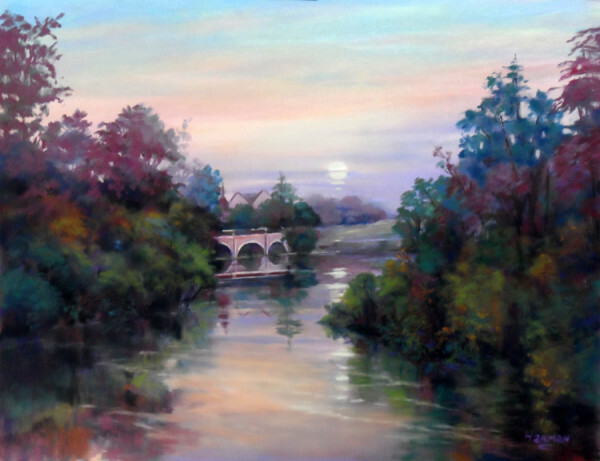 Set up in the early New Year 2014 Pastel Artists UK is now an extremely successful Facebook group and for me, it is both gratifying and frustrating. Gratifying because they are a great group. Why frustrating? Because I am a tutor and there is only so much guidance you can give on a Facebook group. The group has consolidated what I already suspected; overall pastel tuition, by a professional pastelist/tutor, is poor to non-existent, with notable exceptions obviously. There is even a lack of good beginner drawing classes which is really an issue for those who want to progress in their work in any medium? Ironic that this should be the case at a time when the popularity of pastel is on the rise, with new Chinese and Japanese Societies joining the ranks of the European, American and Australasian societies. The group have been a fantastic market research resource and readily responded to my frequent questions for facts on this or that aspect of their work, and they have guided me well. Other pastel groups to which I belong have also, and their needs have proved to be similar, no matter what country they live.